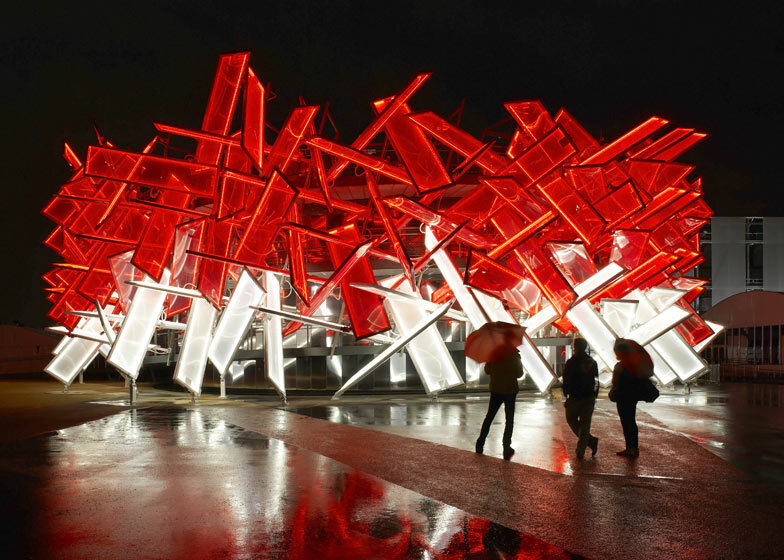 Here are some photographs of the recently completed Coca-Cola Beatbox, a pavilion in the London 2012 Olympic Park that can be played like a musical instrument (+ slideshow). 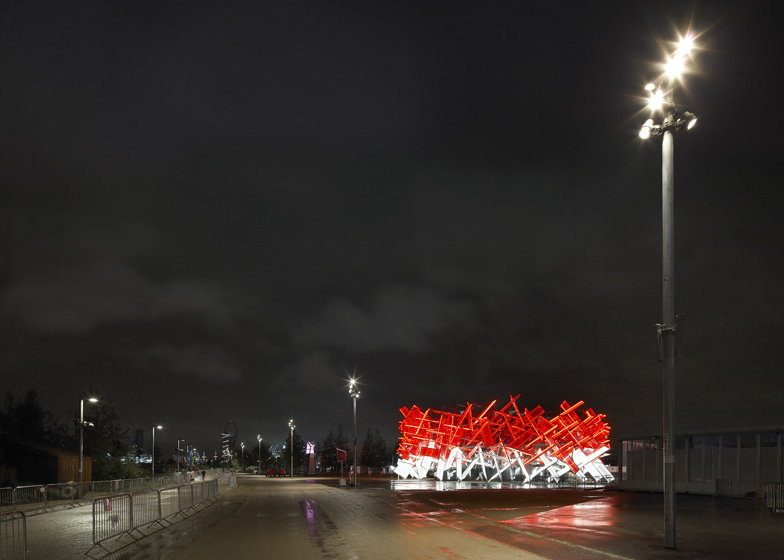 Designed by London architects Asif Khan and Pernilla Ohrstedt, the Coca-Cola Beatbox invites visitors to make a musical collage of sporting sounds by touching parts of its structure. The sound samples, including a human heartbeat and trainers squeaking on a court, are taken from the Olympic song 'Anywhere in the World' recorded by British producer Mark Ronson. The sounds are embedded in 200 interlocking ETFE plastic pillows which are sensitive to movement and touch. The pavilion opens to the public on 27 July. We first published images of the project proposal back in March. Photography is by Hufton + Crow, except where indicated. Coca-Cola has today unveiled the Coca-Cola Beatbox, its iconic pavilion for the Olympic Park, at a private view event ahead of the official opening of the London 2012 Olympic and Paralympic Games next Friday 27th July. 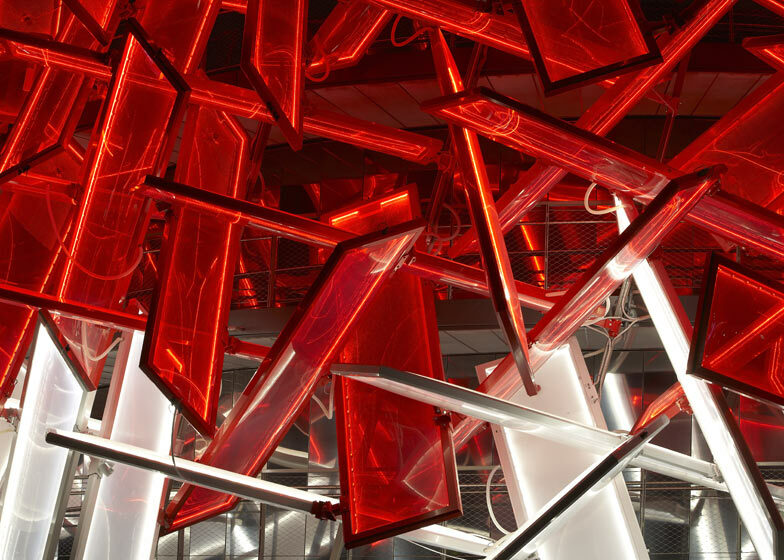 The Coca-Cola Beatbox, designed by Asif Khan and Pernilla Ohrstedt, is an experimental fusion of architecture, sport, music and technology that creates a stunning multi-sensory experience. 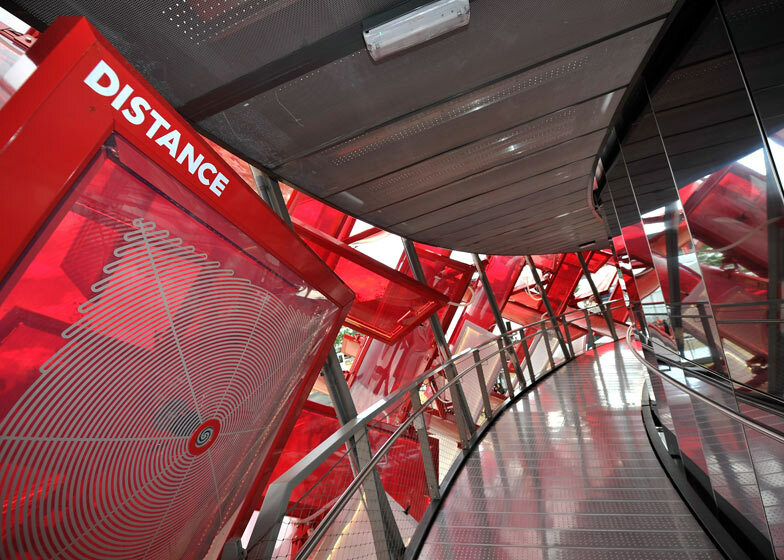 The visionary pavilion has been inspired by Coca-Cola's global campaign for London 2012 - Move to the BeatTM - that aims to connect young people to the Games by bringing together their passions for music and sport. Its giant crystalline structure is made up of over 200 interlocked translucent air cushions, each the size of a billboard. Visitors will be able to 'play' designated cushions as they ascend the exterior of the pavilion, remixing 'Anywhere in the World', the uplifting track featuring sounds of five different Olympic sports created for Coca-Cola by GRAMMY award winning producer Mark Ronson and 2011 Mercury Music Prize nominee Katy B. Integrated within the 200 cushions is groundbreaking audio, lighting and responsive sensor technology, which has been used by the architects to upload the rhythmical sport sounds into the structure of the Coca-Cola Beatbox. Recordings, which include athletes' heartbeats, shoes squeaking, and arrows hitting a target will be triggered and remixed by the gestures and movements of an estimated 200,000 visitors during Games time as they make the 200m journey to the pavilion's rooftop. The pavilion forms part of Coca-Cola's Future Flames campaign for London 2012, which aims to recognise and reward the best of the nation's youth and shine a spotlight on emerging talent to inspire other young people to pursue their passions. 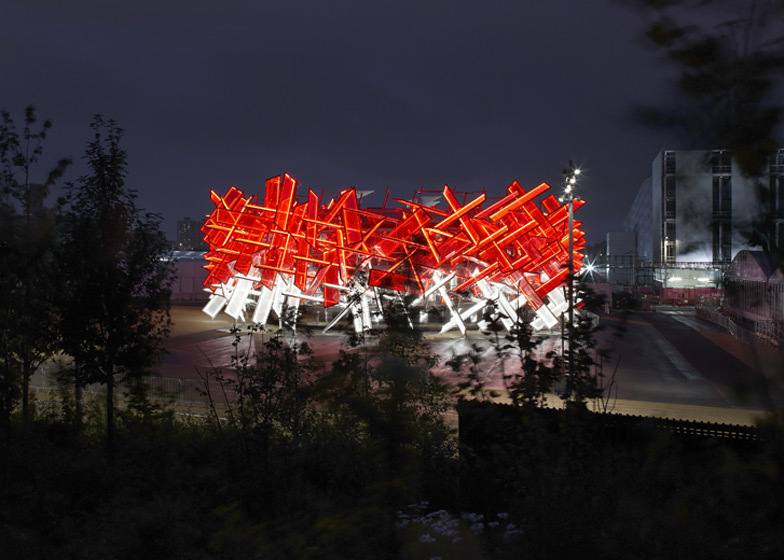 Coca-Cola appointed London-based designers Asif Khan and Pernilla Ohrstedt following a formal commissioning process administered by the Architecture Foundation. The company wanted to identify the best single emerging talent in British architecture and reward them with a showcase at London 2012, handing over creative control of its pavilion. "Coca-Cola's sponsorship of London 2012 is rooted in celebrating and recognising young people and we're delighted to give so many young talents the chance to showcase their skills and passions on the world's stage. Our team of emerging architects, artists, sound and light technicians - led by Asif Khan and Pernilla Ohrstedt - have all played a crucial role in creating a pavilion that is hip, fresh and energetic. 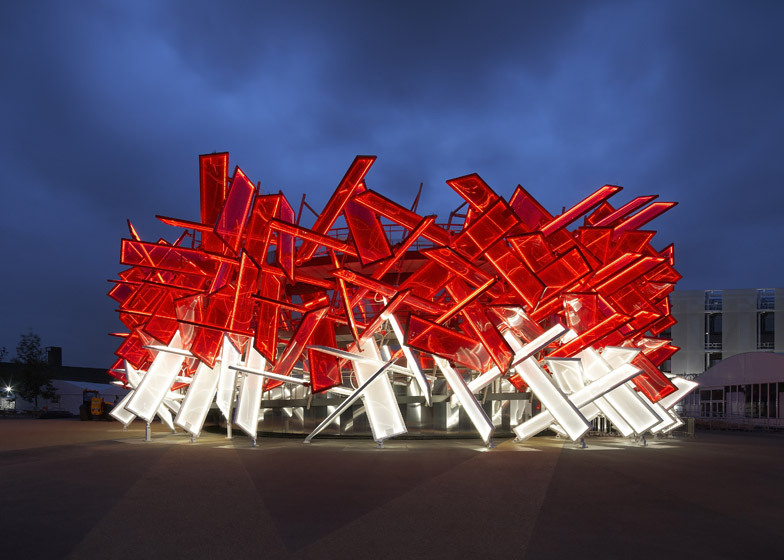 The Coca-Cola Beatbox is unlike anything else on the Olympic Park. Over 300 young performers from London will help to bring it to life during Games time, and it will stand as a testament to the millions of young people who use their passions in areas like sport and physical activity, music and dance to spread happiness in communities all over the UK." 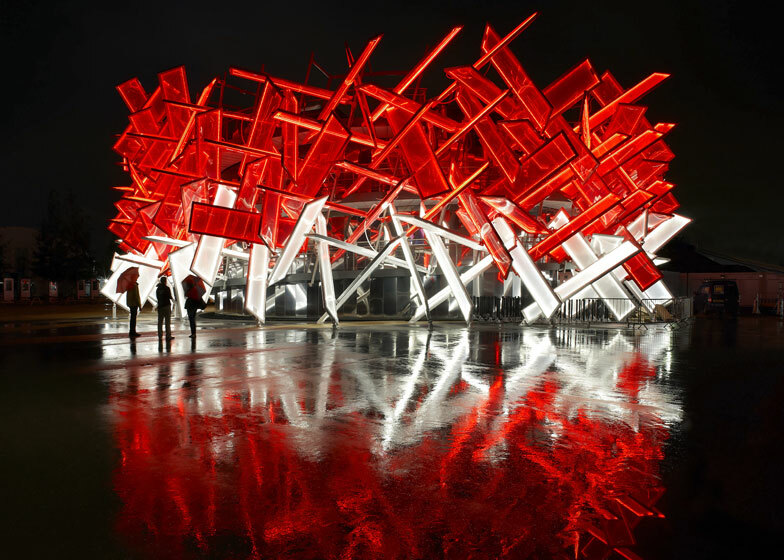 "The Coca-Cola Beatbox is our largest commission so far and we're thrilled to have the opportunity to showcase our distinctive brand of architectural design at London 2012. We have created a structure that fuses architecture, music, sport and technology in a completely unique way. The beat will draw people in and allow them to personally experience sports through sound away from the main Games venues. Coca-Cola has really allowed us to push the boundaries and we're looking forward to unveiling the pavilion to the world when London 2012 opens its doors next week." 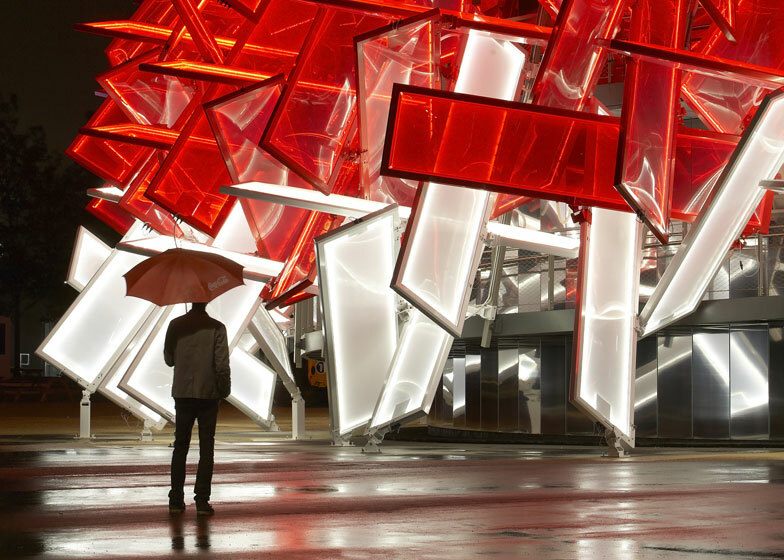 Within the Coca-Cola Beatbox pavilion visitors will discover Jason Bruges Studio's Aerial Dynamics installation. A living, breathing light show that has been designed to emulate the energy released when a bottle of Coca-Cola is served and shared. 180 bespoke mechatronic 'bubbles' glow rhythmically in time with Mark Ronson's track. Controlled with individual code, each bubble has eight polypropylene blades that fold in on themselves. Special sensors embedded in the three 'cheers in celebration' kiosks at the base of the Beatbox detect when Coca-Cola bottles are clinked together, triggering the blades and bubbles to glow with red and white LED lighting. These light patterns become increasingly intricate as the number of participants grow. "Our installation captures the celebratory aura that surrounds the Games and is itself a living, visual, dynamic performance. We worked closely with students Coca-Cola chose from the Royal College of Art who helped create the final design through a series of design workshops. A unique mix of architects, lighting designers, industrial designers, programmers and engineers have all collaborated to bring this extraordinary installation to life." The Coca-Cola Beatbox was brought to life at the private view event by young performers from across London boroughs. These talented young people from part of a group of 300 who have been selected to perform within the Olympic Park and London's Hyde Park following six month audition process with the support of the interactive theatre company London Quest. Whether it's re-enacting a medal winning performance or encourage visitors to recycle they will help to bring the magic of London 2012 to life in the Captial. "We at London Quest have thoroughly enjoyed the last year working in partnership with Coca-Cola. In awarding us a theatrical consultancy contract for their Olympic Games showcasing activity, Coca-Cola has given us a massive opportunity to promote our company to the world and it's great to know that we have helped to give some very talented young performers a once in a lifetime opportunity to shine."